I recently decided that Feldon would be more fun as a Real commander than a Tiny Leader, so I added 50 cards to this deck to bring it up to the big leagues (keeping the TL core so I could revert back if I wanted to). I started the game with 2 lands and a Thornbite Staff in hand, but drew some lands and played an early Hissing Iguanar followed by a Phyrexian Soulgorger. Gisa started with a Sol Ring AND Ancient Tomb. Daxos came down with a Thada Adel soulbound with Elgaud Shieldmate as well as a Battle Mastery for double strike. Dax took a Howling Mine and Sol Ring from Jarad, before coming after me (taking Bosh and Perilous Myr). I played Feldon, reanimated the Soulgorger, gave it double strike, and sent it at Daxos do force a block and kill the Shieldmate. Daxos came after me again to take Illusionist’s Bracers and Ashnod’s Altar. Jarad had Boundless Realms’ed for 7 with a Lotus Cobra, and then cast an Eternal Witness to get back Boundless Realms (and also had some big creatues). At some point I had played an Altar of Dementia and sacced a token Soulgorger to mill myself (too many reanimator decks), and I noticed that I had a Priest of Urabrask in the ‘yard AND a Thornbite Staff and Sac Outlet. I waited patently for my turn, tried to combo out and realized that I was one mana short (I needed to use the first Priest Mana to equip the staff). Daxos wiped the board before I could do it again, and Gisa hit me big (no blockers) with a WurmCoil Engine for the life. Jarad’s Vorinclex was countered, but he had the ability to sac something to Jarad to make us all lose 14 life. I was at 14. Two other players were waiting for a game, so I went and played with them. This game took a while to finish, but I think Gisa won. Feldon is the centerpiece. It has the ability to combo, usually involving Priest of Urabrask. When I added in 4+ CMC cards I focused on big Red creatures, cool ETB effects, and Mill things. Self mill to fill my graveyard, but also as a potential win condition. I played basic lands on each of my first 4 turns “ramping” into a Knacksaw Clique (that exiled but did not cast a Yawgmoth’s Will and played a Marsh Flats (for an underground sea)). 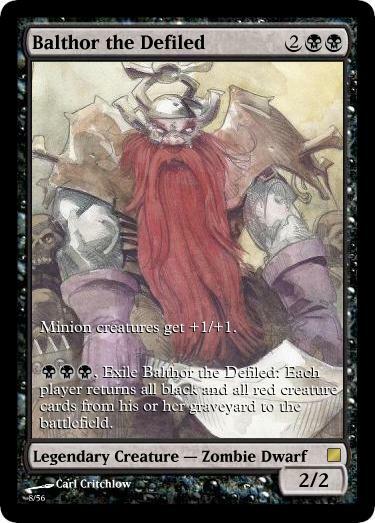 Balthor went. Turn1: Candelabra of Tawnos, Turn 2: Demonic Tutor, Turn 3: Urborg, and Beseech the Queen, Turn 4: Coffers, Turn 5: Vesuva, Turn 6: all kinds of big zombies that kill me dead. By this point more people showed up, and since I was feeling the Faeries, I gave it another go. This game didn’t go that much better for me. I played a Shadwomage Infilitrator early and drew a few cards off of it. This time it was Emmara that had the ‘If this were a tournament for money or prizes*, I’d swear the deck was stacked and call a judge” hand. Mirari’s Wake followed by Doubling Season and Parallel Lives, followed by a Phyrexian Rebirth followed by Parallel Evolution (and Flashed Back) for about 72 5/5 creatures. I had a ton of fun in my hand (Denying Wind, Dusmantle Guildmage, other fun cards) but all I managed was to Oona-away the Mirari’s Wake (that had been top-of-the-libraried). Then we all died horribly again. This is a mill/ exile library deck. It can make tokens, it has some discard (but most of the discard is incidental now, as I re-tooled it to be more Mill when I built Gwendlyn). I don’t love resource denial that much, so I don’t play this one often, but I do have some cool Faerie Rogue Tokens to play with it, and it’s also got a few pretty foils. My brother and fiance were both down to play a guild deck game again, so we gathered ’round the dining room table. I had a 4 land hand, but very few swamps. I played Bloodletter’s Quill (which is a silly card). Lazav came out on turn 5.
the Boros guild (fiance) had a Viashino Firstblade, and brother Selesnya had a Phantom General. An Armada Wurm ended up in the graveyard, so Lazav became it and so did a Dimir Doppleganger. The Boros swung at me with Tajic, Firemane Avenger and something else to hit for 12. I Hex away most of the board and Lazav becomes a Phytohydra. Aurelia swings at the Selesnya (who have a Trostani’s Summoner and some tokens), with Aurelia, Tajic, Agrus Kos and another dude, but Kos gets killed. Trostani is down to 10 and has 18 general damage. Lazav and the Doppleganger are now both Giant Adephages. Trostani regains some life, and convoke Exiles the Doppleganger-adephage, and Razia joins Aurelia. Then they kill Trostani. I Mind Grind for 7, but I think it gets Frontline Medic-ed. So I kill the Medic and use Codex Shredder to get back Mind Grind, cast it for 8 and win via Mill. About the Deck: This is a Guild deck. All the cards are from Ravnica sets, and are either Dimir Stamped or un-guilded.